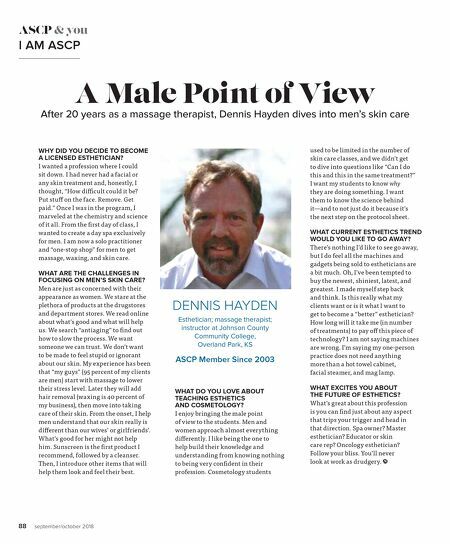 88 september/october 2018 ASCP & you I AM ASCP A Male Point of View After 20 years as a massage therapist, Dennis Hayden dives into men's skin care WHY DID YOU DECIDE TO BECOME A LICENSED ESTHETICIAN? I wanted a profession where I could sit down. I had never had a facial or any skin treatment and, honestly, I thought, "How diffi cult could it be? Put stuff on the face. Remove. Get paid." Once I was in the program, I marveled at the chemistry and science of it all. From the fi rst day of class, I wanted to create a day spa exclusively for men. I am now a solo practitioner and "one-stop shop" for men to get massage, waxing, and skin care. WHAT ARE THE CHALLENGES IN FOCUSING ON MEN'S SKIN CARE? Men are just as concerned with their appearance as women. We stare at the plethora of products at the drugstores and department stores. We read online about what's good and what will help us. We search "antiaging" to fi nd out how to slow the process. We want someone we can trust. We don't want to be made to feel stupid or ignorant about our skin. My experience has been that "my guys" (95 percent of my clients are men) start with massage to lower their stress level. Later they will add hair removal (waxing is 40 percent of my business), then move into taking care of their skin. From the onset, I help men understand that our skin really is diff erent than our wives' or girlfriends'. What's good for her might not help him. Sunscreen is the fi rst product I recommend, followed by a cleanser. Then, I introduce other items that will help them look and feel their best. WHAT DO YOU LOVE ABOUT TEACHING ESTHETICS AND COSMETOLOGY? I enjoy bringing the male point of view to the students. Men and women approach almost everything diff erently. I like being the one to help build their knowledge and understanding from knowing nothing to being very confi dent in their profession. Cosmetology students DENNIS HAYDEN Esthetician; massage therapist; instructor at Johnson County Community College, Overland Park, KS ASCP Member Since 2003 used to be limited in the number of skin care classes, and we didn't get to dive into questions like "Can I do this and this in the same treatment?" I want my students to know why they are doing something. I want them to know the science behind it—and to not just do it because it's the next step on the protocol sheet. WHAT CURRENT ESTHETICS TREND WOULD YOU LIKE TO GO AWAY? There's nothing I'd like to see go away, but I do feel all the machines and gadgets being sold to estheticians are a bit much. Oh, I've been tempted to buy the newest, shiniest, latest, and greatest. I made myself step back and think. Is this really what my clients want or is it what I want to get to become a "better" esthetician? How long will it take me (in number of treatments) to pay off this piece of technology? I am not saying machines are wrong. I'm saying my one-person practice does not need anything more than a hot towel cabinet, facial steamer, and mag lamp. WHAT EXCITES YOU ABOUT THE FUTURE OF ESTHETICS? What's great about this profession is you can fi nd just about any aspect that trips your trigger and head in that direction. Spa owner? Master esthetician? Educator or skin care rep? Oncology esthetician? Follow your bliss. You'll never look at work as drudgery.